One of my most-cherished sources of White Rock and Lovewell history is Excelsior colonist Harry Wallin. A Brooklyn native who arrived in Jewell County with a few dozen fellow settlers in the spring of 1869, Wallin and some of his neighbors jointly wrote a letter to their friends back in East New York, telling of their recent, narrow escape from death or worse at the hands of Tall Bull’s Sioux and Cheyenne Dog Soldiers. Thirty years later he wrote a detailed history of the short-lived colony for the Belleville Telescope, including events they witnessed after retreating to the relative safety of the colony house at Scandia in Republic County. The Excelsior group had survived a train derailment, marched through the charred aftermath of a prairie fire, and then crossed a dangerously swollen Republican River, some of the men losing most of their possessions in the process. Throwing together a ramshackle fort, colonists crowded inside its protective walls in the nick of time, just before more than a hundred hostile Indians descended on their settlement. After Tall Bull’s band moved on and the colonists withdrew to Republic County, Wallin and his wife witnessed the killing of young Malcolm Granstedt by Indian stragglers bent on stealing a few horses the boy was looking after. Over a period of only a few weeks Mr. and Mrs. Wallin may have witnessed a generous slice of regional history, but perhaps not as big a chunk as they thought they had. Harry Wallin also mentioned seeing the Forsyth Scouts ride through Republic County on their way to the Arickaree fork of the Republican River to keep a date with Plains history that would be known as the Battle of Beecher Island, a protracted fight named for a young man Wallin claimed he had known. 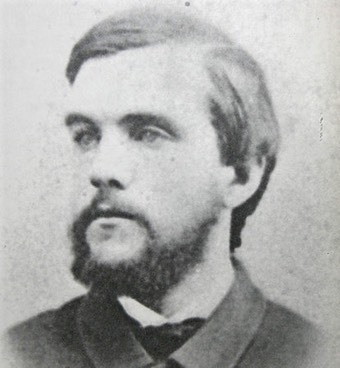 A nephew of Henry Ward Beecher, Lt. Beecher was a man Harry Wallin thought he had known back in Brooklyn. Wallin was probably wrong. It was here where young Beecher fell, Henry Ward Beecher’s son. Young Beecher I knew well as he came from the same place in Brooklyn I did. In his young boyish days he was a lively lad, good and full of fun. He was a good soldier but done a foolish thing at the last. 'Lone Dog' I believe was the name of the chief … a man of six feet four or five inches and sat on his beautiful black pony like a stone statue, and his hoarse commands could be heard above all the noise of the battle. As for poor Beecher, he had been doing good fighting from the start to the end and credit is given to him as the one who killed the chief. When toppled from his beautiful horse Beecher raised himself up from the hole he had been lying in and with hat in hand hurrahed and fell back a corpse; a sharpshooter did the business. Wallin’s account of the fight on the Arickaree did not stray too far afield, except for such details as the name of the chief, which was Roman Nose, not “Lone Dog.” And, while Harry Wallin could have known Henry Ward Beecher, who did live in Brooklyn, Lt. Frederick H. Beecher was Henry Ward Beecher’s nephew, not his son. Lt. Beecher did not die after hurrahing in triumph about shooting the Indian chief. Alhough the two may have been shot around the same time, both lingered for some hours. Some accounts have them dying on different days. Finally, it was not even the Forsyth Scouts that raised a cloud of dust as they approached Scandia on that June day in 1869, but a completely different group of scouts led by Colonel Moorhouse, the Kansas Adjutant General, arriving to inspect the region that had been the scene of so much carnage in recent weeks. Harry Wallin watched a column of scouts ride up in the spring of 1869, heard about the Battle of Beecher Island, which had happened months earlier, in the summer of 1868, and to use a word given some currency by NBC newsman Brian Williams, he had conflated the two. Yes, it really does happen, and always has. I thought about Wallin after receiving a phone call yesterday from a New York newspaper reporter, fishing for information about Brian Williams. The NBC Nightly News anchor got his first leg-up in journalism at the TV station I work for, and I’m almost the only one there who remembers his tenure with us. Was there something about the pickle Mr. Williams currently finds himself in, the reporter wondered, that resonated with me, jogged some flash of memory? Would I mind helping the news anchor take his place under the bus? Hadn't Brian done something like this before, back when he was a fledgling reporter? Was there any indication way back then that we had a budding serial-misrememberer on our hands? No there wasn’t, I assured him. Brian performed his duties much more than competently, cheerfully approaching new tasks with aplomb, even when he was clearly out of his element, as when he had to sprew out a string of sports scores on the weekend. His bosses certainly had no complaints about him and were sorry to lose him when he left, as everyone knew he would have to, when it was time for Brian Williams to pursure loftier ambitions. I admitted to being baffled by his varying descriptions of a helicopter ride he took in Iraq in 2003, and what seems to many a disappointing apology, what has, with tiresome journalistic inevitability, been dubbed “Choppergate." That is, I was baffled until I remembered Harry Wallin. Is Brian Williams a chronic liar? I very much doubt it. It’s just that his memory works the same way Harry Wallin’s once did, and almost everyone else’s still does. Memory is a much more malleable resource than we suppose. When a public figure lets an anecdote out to stretch its legs on the talk-show circuit, it can often do just that, becoming an ever-taller tale. Unfortunately for him right now, Brian is convivial. Much more than a mere news reader, he is a performer, a born raconteur who loves to chat. He enjoys appearing on talk shows, and tapes of his frequent appearances are being pored over microscopically at this moment, in a search for discrepancies. This morning I saw a comparison of stories he sometimes tells about his early days as a volunteer fireman, especially one about rescuing a puppy from a burning house. No, wait. Someone found a version where it was two puppies. Oh, no! Not “Puppygate!"